Working hard to avoid disappointing her teacher, Manuela was motivated to do her best in mathematics and in 8th grade she won the County Mathematics Olympiad with a maximum score. She has gone on to prepare scores of students to excel in mathematics and follow in her footsteps by winning competitions. Over the last 25 years she has brought her community 64 international, 133 national and over 430 county prizes. Apart from offering additional tuition for the brightest mathematics students, she has achieved this by engaging her classes to consider the real-world impact and relevance of mathematics. 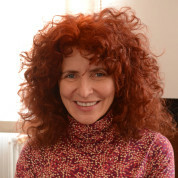 Her method focuses on creative problem solving and application rather than following the prevailing technique of learning and repeating theoretical concepts. Manuela has shared her teaching approach by contributing to over 40 course books and is a member of the national curriculum board. Now the principal of the high school where she once graduated, Manuela has also been involved in promoting STEM extra-curricular activities that have further inspired her students. The school has received two awards for innovative projects in science education thanks to her initiatives. And despite being in a poor area of Romania, her students get very high marks in their graduating exams and some have gone to prestigious universities like Harvard and Princeton. Join the #TeachersMatter movement by sharing Manuela Prajea’s update.